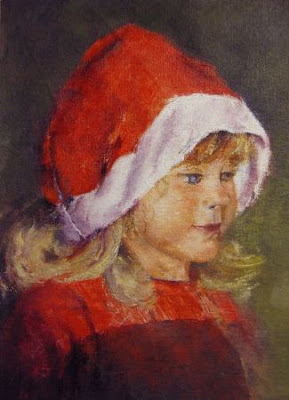 This painting was done from a photograph with the kind permission of Diane, the photographer. Thanks you for the oppertunity! I thoroughly enjoyed painting her and hope I have done her justice! Maybe if you are still in contact with the parents you cen get them to have a look see. This is so sweet and would make an excellent Christmas card, don't you think? I would think her parents would snap up this wonderful painting. She looks so angelic. Oh she's absolutely magic Carol! I'll let you know what reactions Diana gets from her parents! Barbara, thank you, yes, it would make a good Christmas card. Maybe we will use it for our Family greetings this year! Thanks Jean. I actually don't know if her parents have seen it yet. Thank you Megha, for your kind words and the visit. Thanks Liz - yes, please let me know what the reaction is.